How to paint robot droid soldier. 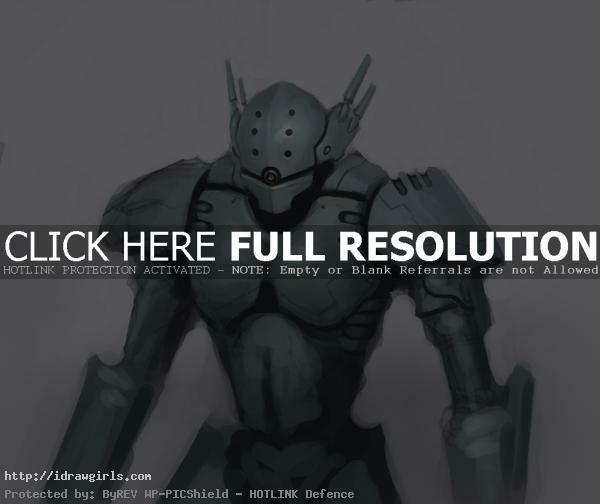 This video shows you how to painting Mecha robot soldier. This tutorial shows you from drawing step to rough finished painting. You can scroll down further to see step by step images with instruction. This video is done in 2009, you can browse around the website to find newer and better video. This rough Mecha robot concept design for concept art and illustration. This is a little more than basic step by step how to sketch in the first stage whenever I want to start to come up with concept idea. I usually do this really quick. 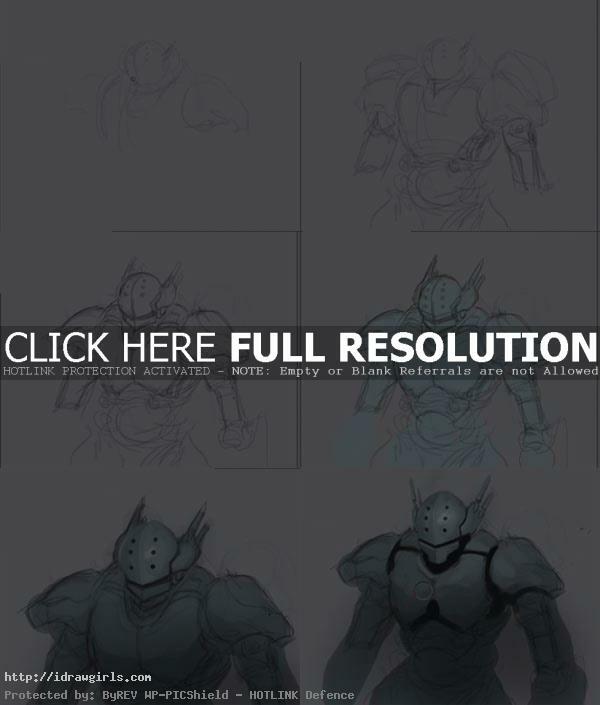 How to put rough idea onto the paper sketching and create sci-fi character concept art online lesson for comics cartoon illustration, manga, and anime. The video demonstrates how to quickly create an efficient concept design from concept idea into visual. This concept is a Mecha robot soldier droid. Mecha*, also known as meka or mechs, are walking vehicles controlled by a pilot. Mecha are generally, though not necessarily, bipedal. In most science fiction stories in which they appear, mecha are war machines: essentially armored fighting vehicles with legs instead of treads or wheels (there are some exceptions). Some stories, such as the Japanese manga Patlabor, also encompass mecha used for civilian purposes such as heavy construction work, police functions, or firefighting. Here is a final Mecha color sketch. Below are step by step easy to follow image with drawing instruction. Step 1, I start off with just really rough basic shapes for head and shoulder. Step 2, then I start to branch out from the middle to explore more interesting shapes that would fit the design I have in mind. Step 3, now I have a more solid design that I can start painting. Step 4, I lay down base color for the Mecha robot droid. Step 5, I begin to assign basic light and shadow. Step 6, I keep refine light and shadow so that it reflect some kind of sheen metal material on the Mecha robot texture on the body. Tips, light and shadow are the most important key to convey your texture like metal, plastic, skin, fur, etc. could you expand on what you are selecting in Photoshop for each stage on shading and detailing, the videos don’t make that very clear.